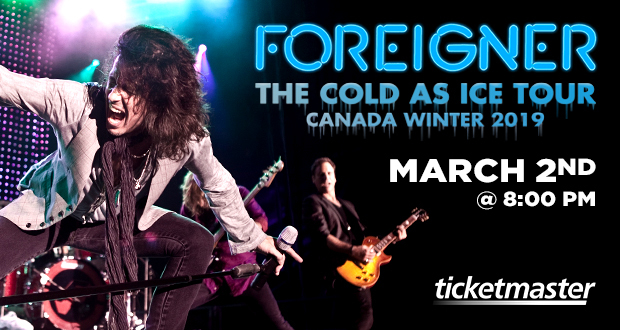 FOREIGNER, the band behind “I Want To Know What Love Is,” “Cold As Ice,” “Juke Box Hero,” and so many others of rock’s most enduring anthems, announces the Winter 2019 Cold As Ice tour. The legendary rock band will heat up the cold Canadian nights with a series of “hot blooded” tour dates including March 2 at Bell MTS Place Theatre. Since the 1977 release of their first hit “Feels Like The First Time” and their self-titled debut album on Atlantic Records, FOREIGNER has been universally hailed as one of the world’s most popular rock acts with 10 multi-platinum albums, 16 Top 30 hits, and worldwide album sales exceeding 80 million. Responsible for some of rock and roll’s most enduring anthems including “Juke Box Hero,” “Cold As Ice,” “Feels Like The First Time,” “Hot Blooded,” “Waiting For A Girl Like You,” “Urgent,” “Head Games,” “Say You Will,” “Dirty White Boy,” “Long, Long Way From Home,” and the worldwide #1 hit, “I Want To Know What Love Is,” FOREIGNER continues to rock the charts more than forty years into the game.